Enjoying the great outdoors is a wonderful experience - from camping, fishing, hunting, and taking time with family & friends! Growing up in my family included all these outdoor opportunities! The time bonding, learning, and experiencing the outdoor life are now cherished memories, never forgotten as they will always hold a special part in my life! Pennington Creek Hunting Club holds over nine thousand acres of privately-owned ranch land. The land is located within Johnston as well as Murray counties. The club headquarters is in Mill Creek, Oklahoma (8301 West Rocky Road). The hunting club offers excellent opportunities for hunting (deer, hogs, turkeys) as well as fishing for bass. The area holds one of the most beautiful streams along with creek bottoms, peaks, woodland, inducements, and prairies. For more info or to make reservations, please call 580.223.3390. Sign up for our email newsletter to keep with the Lake Texoma community. We promise no spam and a simple opt-out whenever you like. 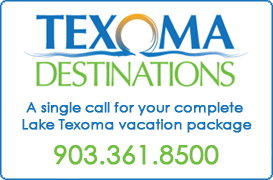 Visit our Lake Texoma Sponsors! Water stained; 66–70 degrees; 3.69’ low. Black bass are good on Texas rigged craws, topwaters and squarebill crankbaits. Crappie are good on minnows and jigs Striped bass are good on slabs. Catfish are fair on trotlines.